Where was I? Oh, yes. Phyllis. But enough about our agenda! Let’s get right on to Would You Read It, shall we? Today’s pitch comes to us from the delightful Rebecca C (not the same as Rebecca H whose YA pitch we had last month!). Before writing for children, Rebecca inspected pantyhose, taught English in Taiwan, worked for a Russian comedian and traveled the world as a tour director. Born in America, she now lives in England. Rebecca writes picture books and poetry, and her fractured fairy tale ‘Monsterella’ won the 2011 SCBWI Barbara Karlin grant. Please send YOUR pitches for the coming weeks! For rules and where to submit, click on this link Would You Read It or on the Would You Read It tab in the bar above. There are openings in early June – not that far away! – so go ahead and send your pitch for a chance for it to be read by editor Erin Molta! See you Friday for PPBs, and hopefully with more updates from Phyllis, and maybe this month’s Straight From The Editor! I'm thinking this might be the same Catherine below? If not, then I apologize for the assumption. Will take on board your suggestion. Many thanks! Thank you, Christie! My mother's name is Myrna so I couldn't resist using it as a 'witch' name, although she is anything but. 🙂 She's here visiting from the US now, so it's been really nice to share everyone's comments about my pitch with her. You sound like you've got a great sense of humor, Coleen. Thank you for your comments! In the case of 'Monsterella' I was generating ideas for fractured fairy tales and came up with an image of a Fairy Godmonster. The title fell into place naturally. There is so much inspiration at Susanna's blog site. 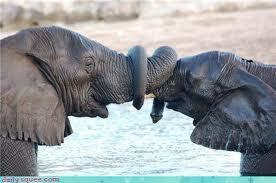 I like the picture of the elephants too, and think there could be a story idea in the term 'eddawentas.' Thank you, Leigh! It's been nice waking up to all these positive and supportive comments and vibes! Yay, for Texas! Or should I say, Yeehaw? I'm pleased to hear the pitch reeled you in, Natalie. Thank you for your comments! Yes, I loved the pitch! The description was excellent and drew me right in and wanting more. Yes! Your pitch is interesting and dynamic without giving away the entire story and the tone of the story comes through beautifully. Nicely done! YES! YES! YES! I would read. Great pitch. Thanks, Jennifer! And sorry not to respond sooner. So kind! Thank you, Heather! I'm feeling fired up now to practice writing a few more pitches. Thanks for the enthusiastic comment, Miranda. Maybe. I would pick it up because I would want to know what a broom rodeo is. From your pitch I was a bit confused. It took me a couple of reads to realize that they were witches and riding brooms, not bulls. I'm assuming they are witches because of the reference to warts. The idea of riding brooms instead of bulls in a rodeo is something I've never seen so your story seems unique and that would make me want to read it. And probably would be a reason why a publisher would want to publish it. Maybe mention right at the beginning that they are riding buckin' brooms. For me riding bulls at a rodeo is ingrained in my head so to get the image out of my head I need something right away that let's me know it's not bulls. I know that you say buckin' brooms, but for some reason it did not register with me until I re-read your pitch but probably would have if I had read it first. Reading about a typical rodeo does not interest me, but witches riding a broom does. Good luck! Monsterella sounds like something I would want to read. I love fractured fairy tales. Really like the pitch -AND the book (I've been lucky enough to read it). I love the callouses and warts. My only thoughts are to say the OLDER Thistlegultch Sisters -to set up the fact that there's a younger one, and to make it clearer that she's in danger so when a bucking broomstick…. THREATENING their younger sister happens, we realise straightaway that she's in danger. Great pitch. Susanna!!! My mom came to visit and guess what she brought with her? Our own copy of Punxsutawney Phyllis! I've read it six times in the last two days. My kids love it! Thanks for your comments on the pitch, Clare (and the book)! I had 'older' in the original pitch and then removed it. I think I'll put it back in. Great point, Rena! Because I know the story, I've assumed too much, and as you say, the reader won't automatically realize the witches are riding broomsticks rather than bulls. Thanks for that! Thanks for chiming in on 'Monsterella' also! Aw! Thank so much for telling me! I'm SO glad you're enjoying it! There are coloring pages and paper dolls and other fun things on my website if you need an entertaining activity to go along with it some rainy afternoon 🙂 Thanks so much!!! Clare, Rena, Miranda, Heather, Jennifer, Coleen, and Christie – thank you all so much for sharing your thoughts with Rebecca! I',m catching up and when I read this Wednesday, I knew I'd have to get back to it to give it the time it needed because I have been out of town. Rebecca, I think your pitch covers the book well (and I, like Clare, have been lucky enough to read this fun manuscript) but I would rearrange it some. Also, if your going to use buckin' you may should use winnin'. Here is my input. For years, the two oldest Thistlegultch Sisters have been winnin' trophies at the Broomstick Rodeo. Now it's time to train their younger sister, Myrna. They practice until they’re chapped under their chaps and have calluses on their warts. But when a buckin' broomstick gets loose and heads toward Myrna, they realize there are more important things in life than winnin' trophies. Fun tongue twisters, Susanna! And I love this—Woolliam (also known as Baahb). That is cute…cute! So true! Winnin' is a key word in this book. And I take both yours and Clare's point about spelling out oldest/eldest T. Sisters at the beginning. I'm so lucky to have such great critique partners! Thanks very much, Penny! I'd read it just 'cause of the name Thistlegulch Sisters. Things as imaginative as that pull me in. As for them being witches. I didn't get it, so I think it should definitely be mentioned. Seems a pretty important part of the tale. Just a thought… Chapped chaps and callused warts can't stop 'em from practicin', but a buckin' broomstick headed for their youngest sister might. It’s the Witchitaw County Rodeo so perhaps if I give that a mention in the pitch it will become clear that the characters are witches. Thanks for your comments, Sharron!